Photo by Adrienne Brammer NYC Veterans Alliance. More than 80 family members and volunteers assembled approximately 300 care packages for New York Army National Guard Soldiers assigned to the 101st Expeditionary Signal Battalion serving overseas at the T-Mobile retail store in Times Square in New York City on July 16 2018. 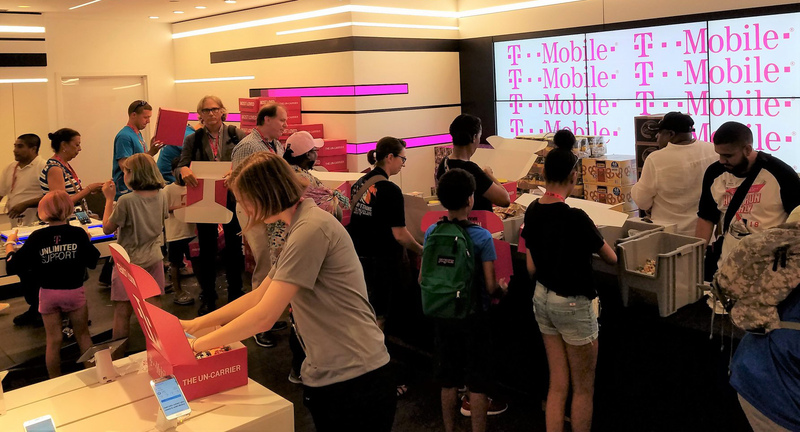 The event was coordinated by the NYC Veterans Alliance Blue Star Families 101st Signal Battalion Family Readiness Group and a generous donation of space and troop items from T-Mobile. The 101st Signal Battalion based in Yonkers N.Y. is currently serving across the Middle East providing communications support to U.S. forces. Photo by Adrienne Brammer NYC Veterans Alliance.